MyPlate is designed to simplify making healthy eating choices. USDA Secretary Tom Vilsack, Surgeon General Regina Benjamin and First Lady Michelle Obama joined together to unveil the new dietary icon "MyPlate" on Thursday. It will replace MyPyramid as the government’s primary food group symbol. 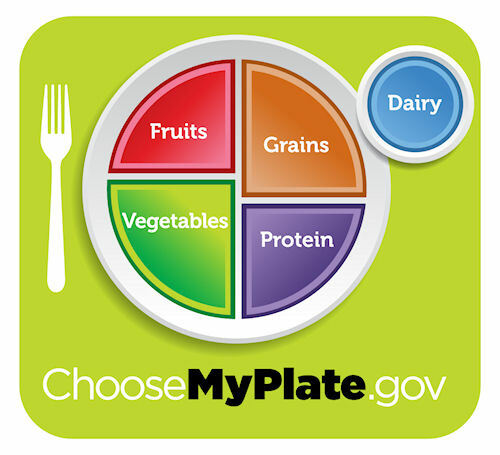 MyPlate is intended to help people make healthier food choices by emphasizing the fruit, vegetable, grains, protein and dairy food groups, but with the message of making half or their plate fruits and veggies. Many nutrition, health and consumer advocates applaud the new icon because it follows the 2010 Dietary Guidelines for Americans - balancing calories, drinking water instead of sugary drinks and avoiding oversized portions among other things - yet is simple and easy to understand. The new Web site www.choosemyplate.gov will provide practical information to individuals, health professionals, nutrition educators and the food industry to help consumers build healthier diets with tools and resources. Vilsack says it is often difficult to determine the best foods to build a healthy meal with the many food options available. He says MyPlate is an uncomplicated symbol to help remind people to think about their food choices in order to lead healthier lifestyles. First Lady Obama says she can already tell how much the new symbol is going to help parents across the country. She says parents just have to look at their child’s plate. It’s as simple as making sure the plate is half full of fruits and veggies and paired with lean proteins, whole grains and low-fat dairy. What USDA has learned over the years according to Vilsack is that consumers are bombarded by so many nutrition messages that it makes it difficult to focus on changes that are necessary to improve their diet. During a multi-year calendar USDA will work with the First Lady’s Let’s Move initiative, public partners and private partners to promote MyPlate, ChooseMyPlate.gov, the nutrition messages and how-to resources, which will be unveiled later this year. Vilsack says this new campaign calendar will help unify the public and private sectors to coordinate efforts and highlight one desired change for consumers at a time. Vilsack says this effort is more than just giving information; it’s a matter of helping people understand there are options and practical ways to apply them to their daily lives. Benjamin says MyPlate can be a fun way to help individuals and families make healthier meal choices. She encourages all Americans to become familiar with the new icon, which she calls a compass to a healthy and fit nation. USDA wants to see how consumers are putting MyPlate into action and is calling on consumers to take a picture of their plates and share them on Twitter with the hash-tag MyPlate. For more information, visit either www.choosemyplate.gov; www.dietaryguidelines.gov; or www.letsmove.gov.